President Trump’s National Security Advisor John Bolton was in Moscow last week organizing what promises to be an historic summit meeting between his boss and Russian President Vladimir Putin. Bolton, who has for years demanded that the US inflict “pain” on Russia and on Putin specifically, was tasked by Trump to change his tune. He was forced to shed some of his neoconservative skin and get involved in peacemaking. Trump surely deserves some credit for that! As could be expected given the current political climate in the US, the neoconservatives have joined up with the anti-Trump forces on the Left – and US client states overseas – to vigorously oppose any movement toward peace with Russia. The mainstream media is, as also to be expected, amplifying every objection to any step away from a confrontation with Russia. Bolton had hardly left Moscow when the media began its attacks. US allies are “nervous” over the planned summit, reported Reuters. They did not quote any US ally claiming to be nervous, but they did speculate that both the UK and Ukraine would not be happy were the US and Russia to improve relations. But why is that? The current Ukrainian government is only in power because the Obama Administration launched a coup against its democratically-elected president to put US puppets in charge. They’re right to be nervous. And the British government is also right to be worried. They swore that Russia was behind the “poisoning” of the Skripals without providing any evidence to back up their claims. Hundreds of Russian diplomats were expelled from Western countries on their word alone. And over the past couple of months, each of their claims has fallen short. At the extreme of the reaction to Bolton’s Russia trip was the US-funded think tank, the Atlantic Council, which is stuck in a 1950s time warp. Its resident Russia “expert,” Anders Åslund, Tweeted that long-time Russia hawk Bolton had been “captured by the Kremlin” and must now be considered a Russian agent for having helped set up a meeting between Trump and Putin. Do they really prefer nuclear war? The “experts” are usually wrong when it comes to peacemaking. They rely on having “official enemies” for their very livelihood. In 1985, national security “expert” Zbigniew Brzezinski attacked the idea of a summit between President Reagan and Soviet leader Mikhail Gorbachev. It was “demeaning” and “tactically unwise,” he said as reported at the time by the Washington Times. Such a meeting would only “elevate” Gorbachev and make him “first among equals,” he said. Thankfully, Reagan did engage Gorbachev in several summits and the rest is history. Brzezinski was wrong and peacemakers were right. President Trump should understand that any move toward better relations with Russia has been already pre-approved by the American people. His position on Russia was well known. He campaigned very clearly on the idea that the US should end the hostility toward Russia that characterized the Obama Administration and find a way to work together. Voters knew his position and they chose him over Hillary Clinton, who was also very clear on Russia: more confrontation and more aggression. 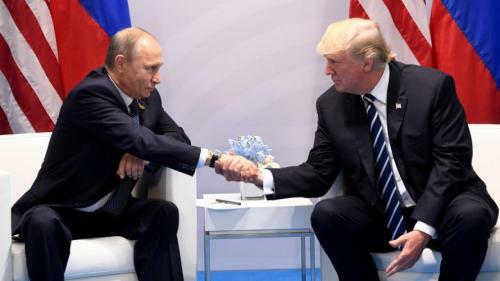 Let us hope that a Trump/Putin meeting begins a move toward real reconciliation and away from the threat of nuclear war.